Visit Teignmouth Devon and the surrounding villages and stay in bed and breakfast, hotel or holiday apartment accommodation provided by BedPosts members. Teignmouth is a seaside town in Devon. As its name suggests, it sits at the mouth of the River Teign where it joins the sea. Teignmouth has the advantage of a river aspect as well as a sea front, the town extending some way up the valley. The 1700 ft long bridge across the estuary of the River Teign leads to the pretty village of Shaldon is said to be one of the largest of its kind in the country. At Shaldon, where fine views can be seen from Ness Headland. Teignmouth One of Devon's oldest seaside resorts, with a long history as a fishing and ship-building centre. Teignmouth port has existed since the 13th Century and is still active today. The town has many Georgian and early-Victorian buildings, including the Assembly Rooms, built in 1826, now a cinema. There are golf courses heigh above the sea, good beaches, a pier and a fine esplanade by the Den, a 6-acre public garden. 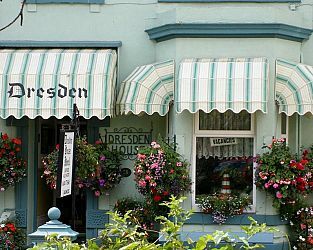 If you seek accommodation near Teignmouth in Devon you have come to the website of a “club” of providers who offer affordable quality accommodation around UK in hotels, bed and breakfasts, guesthouses, inns, and restaurants plus self-catering cottages and apartments .